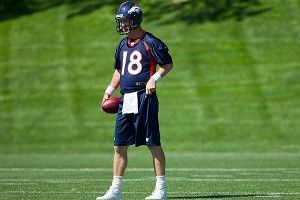 Amount of money Peyton Manning made last year: $42 million. Amount of money David Beckham made last year: $46 million. Number of soccer teams among the top 10 highest-paying sports teams in the world: 7. Number of football teams: 0. Number of consecutive wins by the San Antonio Spurs until their May 31 loss at Oklahoma City: 20. Percentage of Hispanics in the NBA’s regular-season viewership: 12. Percentage by which that’s gone up over the last year: 20. What Hideki Matsui hit in 13 games with the Triple-A Durham Bulls: .170. Number of Japanese media members at Tropicana Field for his debut May 29 with the Tampa Bay Rays: Nearly 30. Number of wins Japanese pitcher Yu Darvish had in his first 10 starts, more than any other pitcher in Rangers history: 7. Number of home runs the Rangers’ Josh Hamilton hit May 8 against the Orioles: 4. Amount of debt Harris County, Texas, still owes on the Astrodome, which was closed and declared unsafe in 2008: $30 million. Estimated amount it would cost just to demolish the facility: $128 million. Projected cost of the Vikings’ new stadium in Minneapolis: $975 million. Portion of that price tag the Vikings will pay: $477 million. Amount the University of Texas spent on athletics last year: $133.7 million. Amount the University of Texas made on athletics last year: $150 million. National rank of those two figures: 1. Number of Division I public colleges and universities in America that spent more than $100 million on athletics last year: 10. Aggregate amount by which the athletics spending at America’s 227 Division I public colleges and universities went up last year: $267 million. What each student at Rutgers ends up having to pay per year on average to support sports: $1,000. The number of full professors that could be hired with that pool of money: 132. Amount per day Notre Dame paid Charlie Weis from November 30, 2009, to June 30, 2011, to not coach the Fighting Irish: $15,066. What NBC got for 30-second ads during this year’s Super Bowl: $3.5 million. What CBS is already getting for the same for next year’s Super Bowl: $4 million. Length in feet of the yacht, called Kismet, owned by new Jacksonville Jaguars owner Shad Khan: 223. Age of former NFL star Junior Seau when he committed suicide May 2 at his California home: 43. Number of seasons he played in professional football: 20. Tackles he made over that time: 1,526. Number of players from the 1994 San Diego Chargers Super Bowl team who are now dead: 8.